Whether you need dungeon vermin or a world-shaking personification of evil, the Tome of Beasts has it. More than 400 new foes for your 5th Edition game-everything from tiny drakes and peculiar spiders, to demon lords and ancient dragons. This is one book you won’t want to miss! You can pick up Tome of Beasts in our store now for just $24.99! 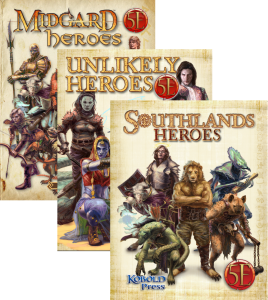 And while you’re there, the Heroes for 5th Edition series is also available, including the bundle of all 3 installments (Midgard, Southlands, Unlikely) for $9.99.